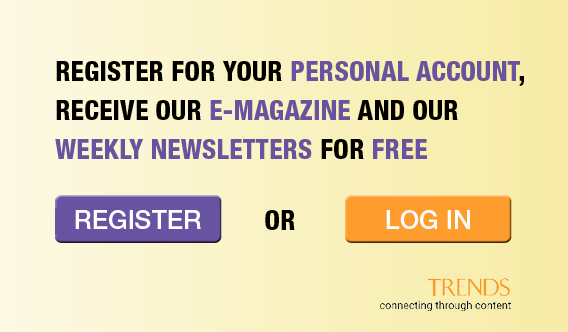 Size constraints on a project often demand a designer's most carefully considered layouts. 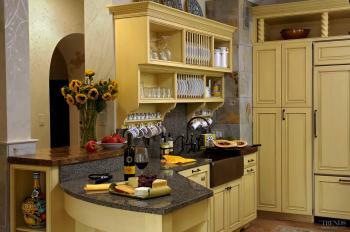 Even the way a cabinet door opens can transform a close kitchen into a comfortable one. This kitchen by designer Jennifer Gilmer answers the clients' request for a modest space with a colorful, optimistic aesthetic. "Every project needs a starting point, and for this kitchen, inspiration came from the ornate 17th-century floor tiles the owner had sourced in Europe," says Gilmer. "From this design lead we created the French Provincial style that runs through the space – responding to the owners' need for a relaxed, vibrant feel." 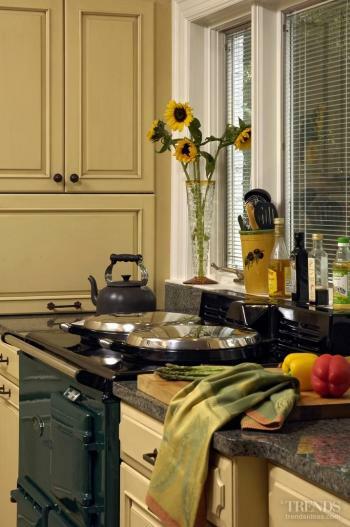 The kitchen features several rustic elements, including a copper butler's sink and the Aga stove – the latter chosen in a distinctive green to pick up on the green in the tiles. 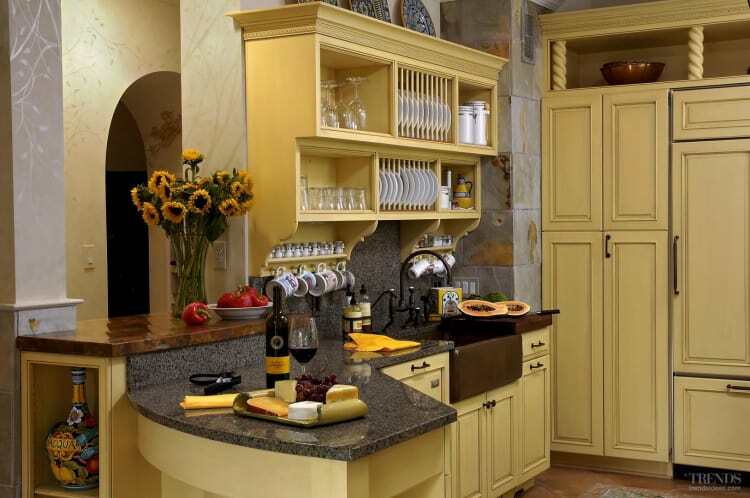 The cheery yellow finish of the cabinets takes its cue from yellow elements in the tilework as well. 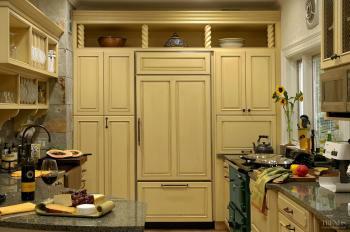 Despite the room's limited dimensions, it has extensive storage, concealed in a back wall of cabinetry. Further cupboard space was created under the peninsula island. 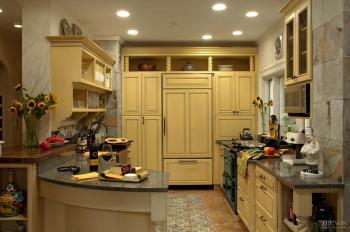 Gilmer says it is spatially economic to dedicate a single wall to floor-to-ceiling, foot-deep cabinetry. "Given the need for storage and the limited area, I also introduced three units with pull-out drawers rather than doors," says Gilmer. "Swinging doors take up much-needed space when you have only so much room to move." Similarly, a bifold door on the pantry to the left of the integrated refrigerator avoids the need for a broad wall area for the door to open back to. 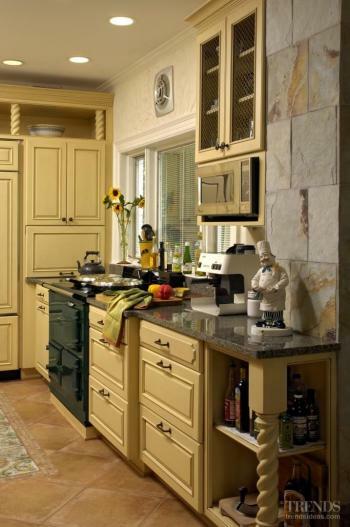 An appliance garage to the right of the refrigerator helps keep clutter off counter surfaces.